Exciting news! The NADFAS (National Association of the Decorative and Fine Art Societies) Grants Committee have awarded us a grant from the Patricia Fay Memorial Fund. 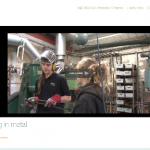 This grant will be used to create a six month ‘Historic Metalwork Restoration’ training placement at Ironart for a talented young female blacksmith, Cecilie Robinson. 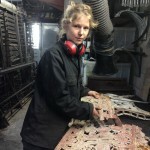 In 2013 Cecilie completed the Extended Diploma in Metalwork and Blacksmithing at The National School of Blacksmithing in Hereford, and was recognized with their ‘Best Student Award.’ Cecilie who lives in Larkhall, and grew up in Bath, was inspired to explore blacksmithing when she visited Master Blacksmith Don Barker’s Forge. Already a talented artist she was part way through a degree in Illustration at Camberwell College in London, before changing tack and pursuing a career in metalwork. Cecilie, who has worked here during her college holidays during the past year to help us out when we’ve been really busy, will shadow the Ironart team on a series of restoration projects during her placement, learning techniques to repair heritage forged and cast ironwork as well as non-ferrous metals. 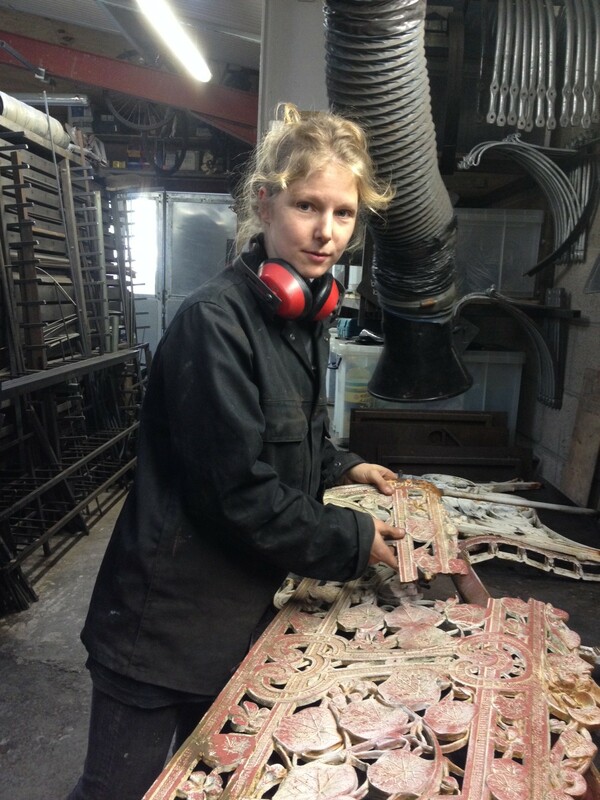 She will also be visiting other workshops, foundries and museums during her time here, to underpin her training. 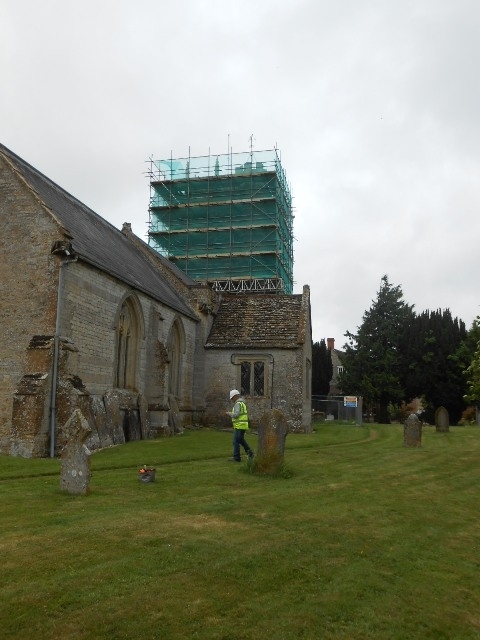 We are really grateful to the NADFAS Grants Committee for this opportunity. 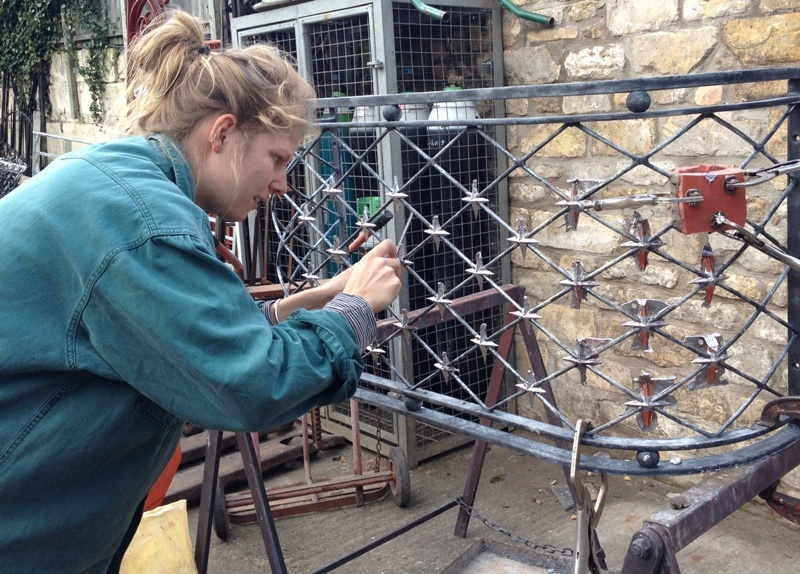 Cecilie has a bright future in blacksmithing and will be a great ambassador for both NADFAS and the trade as a whole. 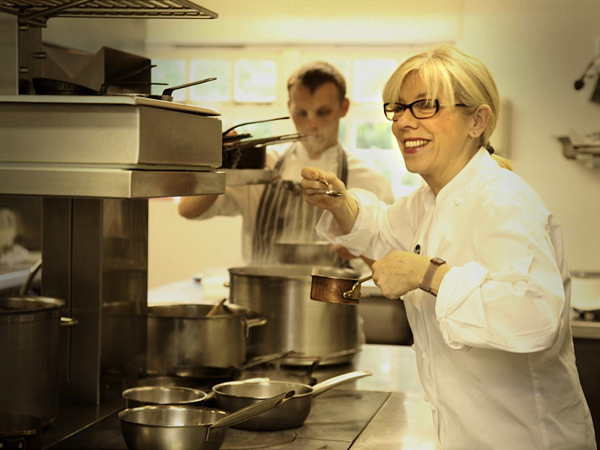 Frances Atkins is a world-reknowned Michelin starred chef. She also happens to be a member of the Ironart extended family as she is married to Nichola’s father Bill. Together they own and run The Yorke Arms in the Nidd valley near Harrogate, North Yorkshire. Last week Frances was awarded 3rd place in the Sunday Times Food List Top 100, making her the highest ranking female chef in the country. It is the latest in a string of accolades for The Yorke Arms, which has held a Michelin star since 2003. The Sunday Times Food List is now in its fourth year, and was based on 80,000 reviews. We are all incredibly proud of you Frances, and for what you and Bill have achieved at the Yorke Arms. You have worked so hard to get to this point, and nobody could deserve it more. 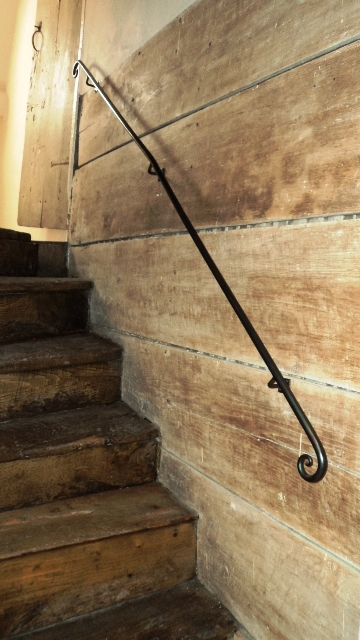 Luke took this photo on site straight after he had finished fitting three elegant handrails in a beautiful Grade II* listed Manor house in Marshfield near Bath. The house has now been decorated and we’ll post more pics when we have some. We’re lucky enough to have Simon Bushell here for a short while. 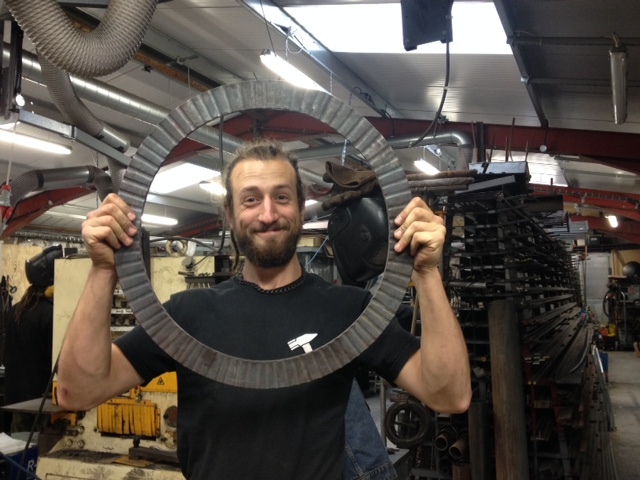 Simon has completed the Hereford College Design & Forgework Skills course, and has joined the Ironart team to help out on a few projects. 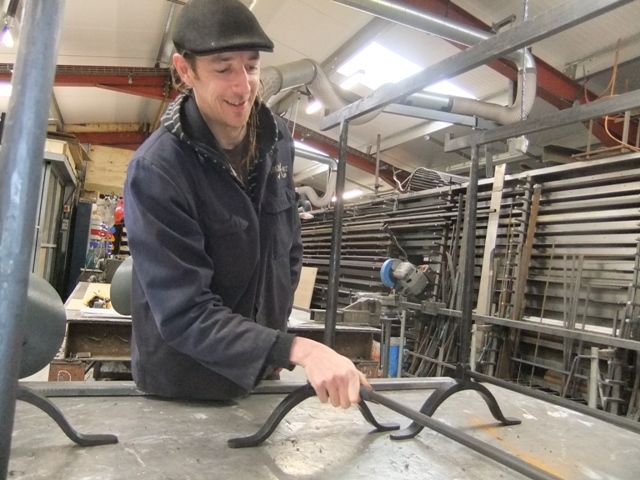 This week he’s been making hinges and working on the new Ironart front gates. 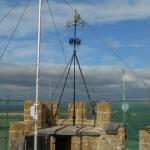 Here’s a link to Simon’s blog – worth grabbing a cup of tea as it makes for an entertaining read, and another link to the Artsthread.com page about his work. 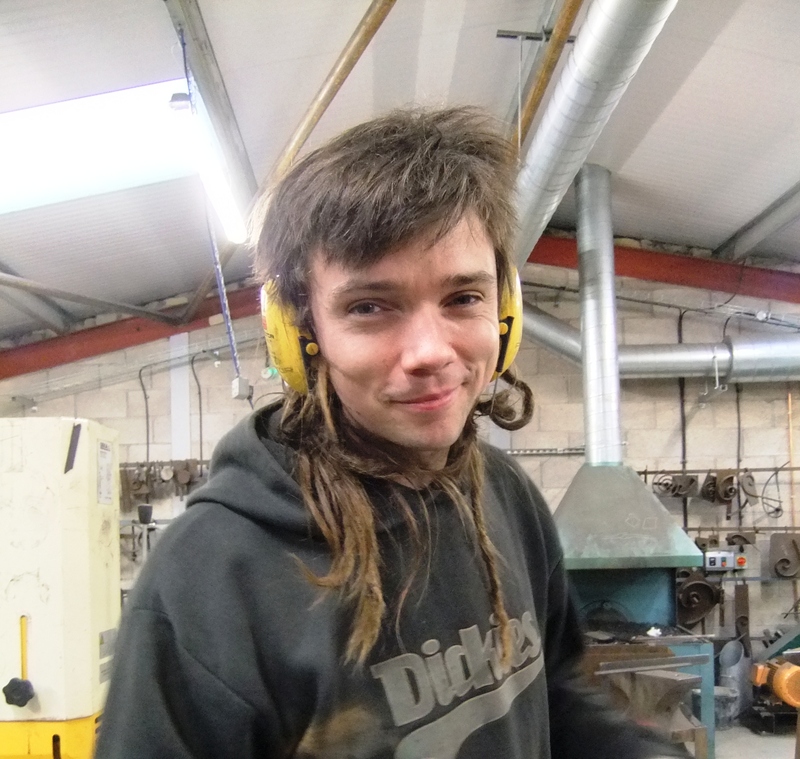 James Cuthbertson – our NADFAS apprentice, has been selected as a finalist in the Manufacturing and Engineering category of the Bath Apprentice Awards which is organised by the Bath Chronicle. 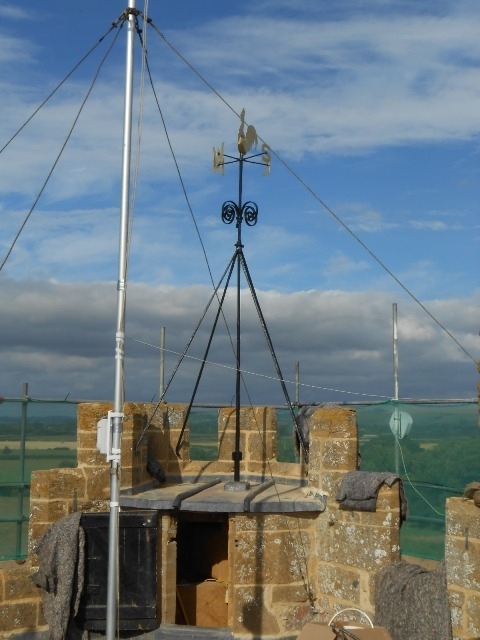 The winners will be announced at the awards on the 4th July, at Bath Racecourse, Lansdown. 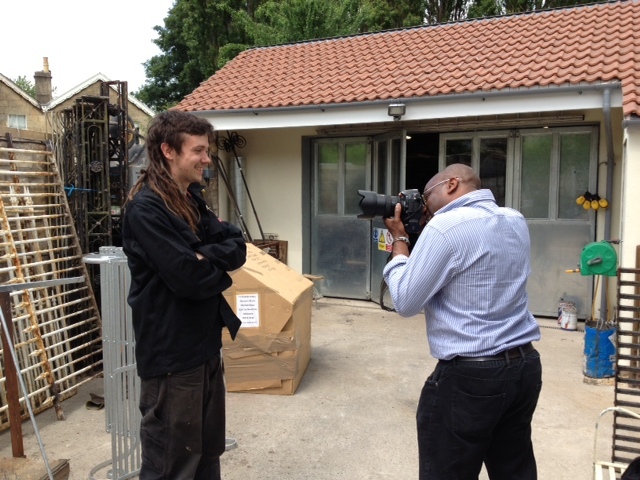 The Chronicle’s photographer came down earlier today to photograph James for the awards. 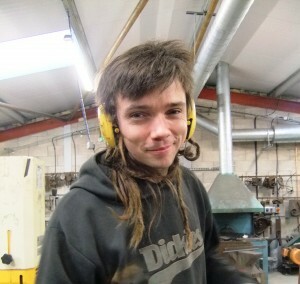 Strike a pose James! 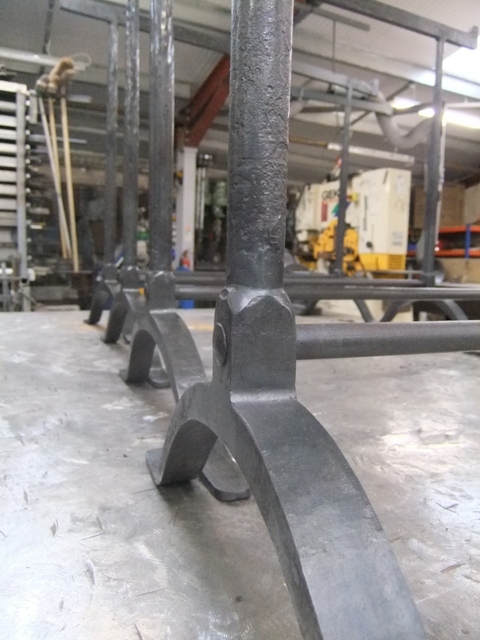 Jim recently made some bespoke trestle table supports. 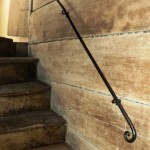 These supports were styled on an antique trestle design which Jim faithfully copied. More pictures of the finished trestle table when we have some. And for our next trick… a coconut shy! 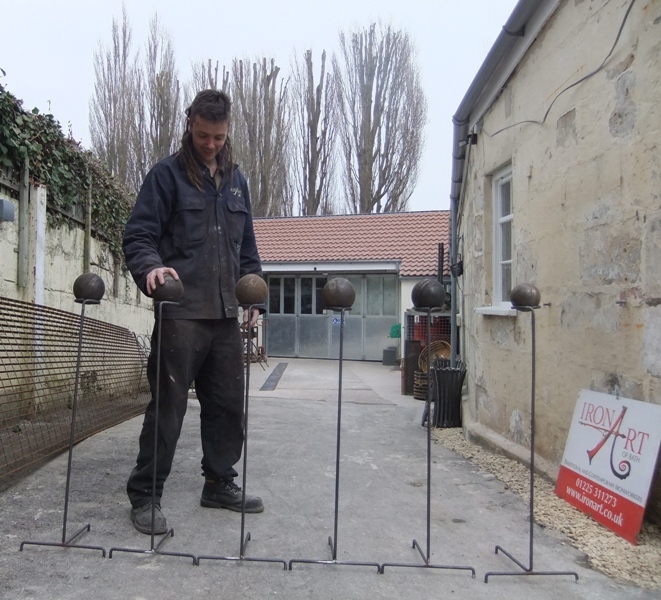 Amidst a backdrop of large and time-consuming ironwork projects comes a completely curved ball in the shape of a commission for a coconut shy! 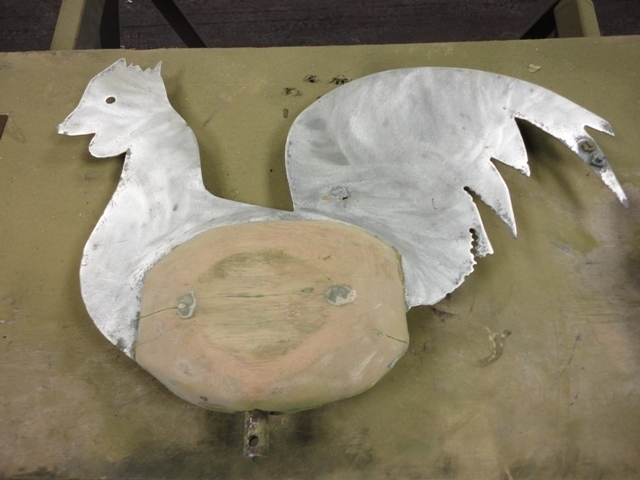 The coconut shy is Ironart’s contribution to the forthcoming Larkhall Festival on 4th – 6th May 2013. Larkhall is a vibrant little community on the edge of Bath and if you’ve never been to take a look around we highly recommend that you come and visit. The festival looks set to be a lot of fun, with exhibitions, concerts, talent contests, food tasting sessions, arts and craft workshops, a casino and a ‘Party in the Park’. Pictured here is our apprentice architectural metalworker James Cuthbertson, with the Ironart coconut shy! 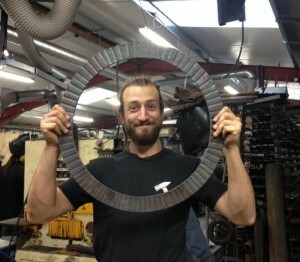 Amazingly James, Ironart’s apprentice ornamental metalworker, has been here for one whole year this month. He has fitted into the team so well it’s hard to remember what life was like without him. 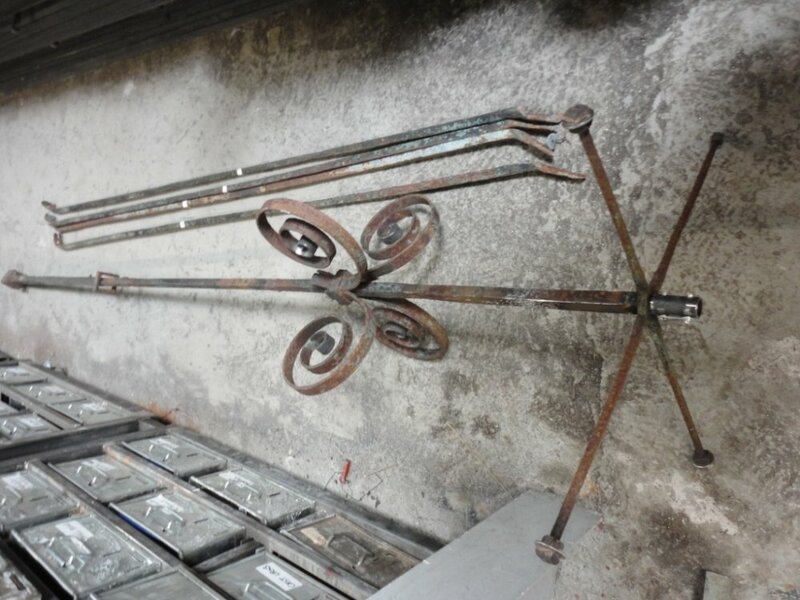 He is such an asset to Ironart both in terms of his metalworking skills, his common-sense approach to everything and his ability to make us all laugh and see the funny side of even the most depressing situation! 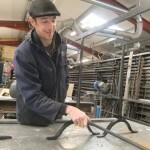 Since we last blogged about James’ apprenticeship he’s been involved with a vast number of key projects here at Ironart. 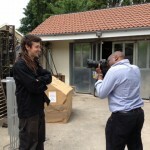 He’s been out on site fitting with Andy, Luke and Jason quite a bit. Most notably a huge set of gates which we made for a private house in Orpington, and an internal balustrade in London. Both were tricky, technical projects. 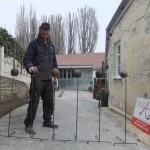 Back in the Ironart workshops in Bath he’s been assembling garden furniture and assisting the other members of the Ironart team with everything from garden benches to gothic chandeliers and the beautiful, contemporary meadow gate. 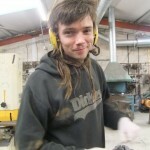 James is now into his seventh week of his ten week course at Hereford College. 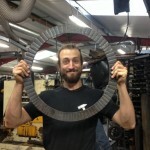 (He’s doing the Blacksmithing Design & Forgeworks skills course on a block-release basis). 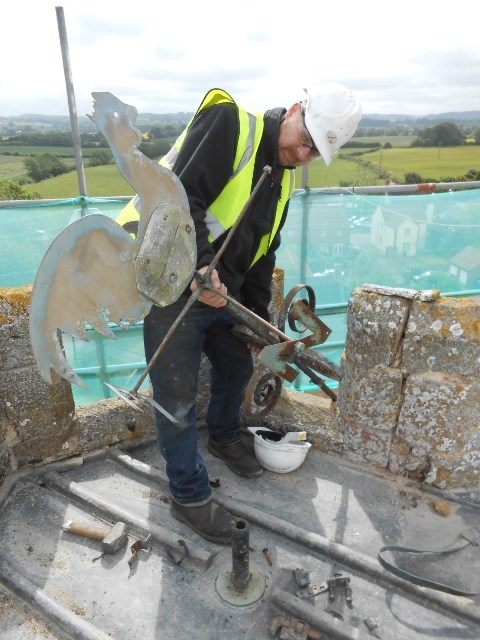 Just recently they’ve been studying repoussee under the expertise of reknowned artist blacksmith and lecturer at Hereford Paul Allen. 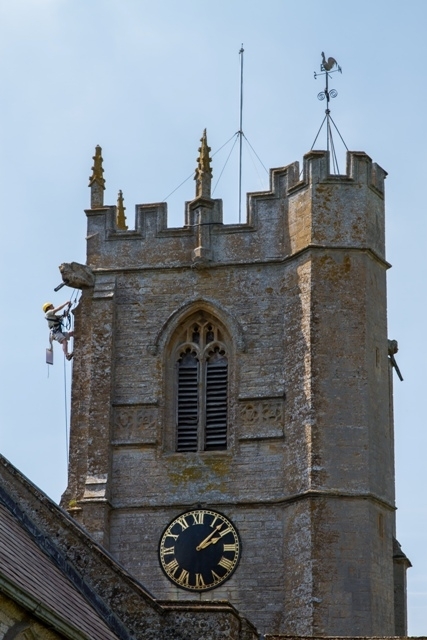 As ever we are extremely grateful to NADFAS, the National Association of Decorative and Fine Arts Societies. 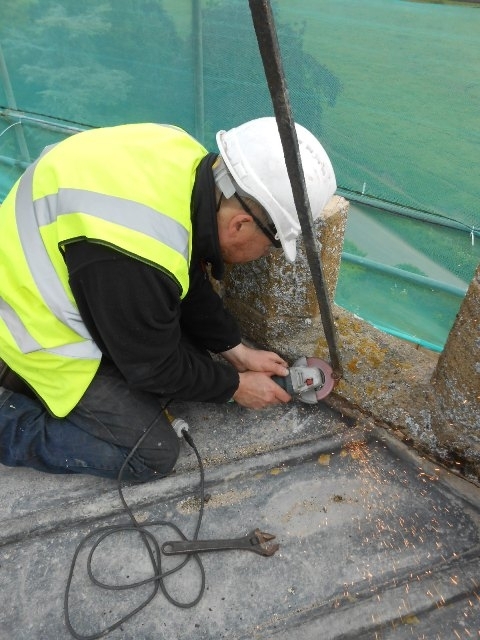 Without their support this apprenticeship simply would not have been achievable. ps: We just heard that James passed his college maths exam with 100% – Norton Radstock College have never had a student pass with such a high mark – they are all amazed. 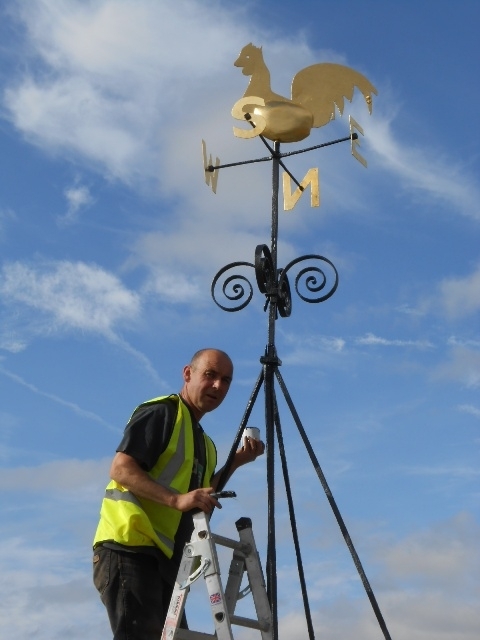 James Cuthbertson you are a man of many talents and we salute you!